Why are these running shoes so ugly? Here’s an incongruity. I’ve been running for the last 18 years on a near-daily basis. It’s only the last 18 months that I’ve given a damn about what color my shoes are. Maybe it’s a peculiarity of aging, to be more picky about such things. It could be directly related to my full time job, in which I work on a team that includes some exceptionally talented and color-savvy graphic designers. On this team, I have acquired some mild notoriety for wearing cool shoes. So when I made my last few decisions about what running trainers to buy, I cringed. 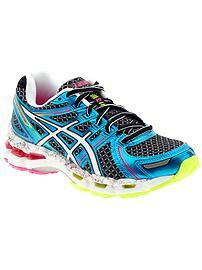 The shoes I was ordering by rote were ASICS Gel Kayanos, which I have been wearing since their very first edition. Version 19 was just released this year, so my allegiance to the model and brand is exactly aligned with my running history. They fit, they feel great, and I enjoy running in them. These are all important things. But for the last few editions, the colors are WRONG. And the 19th release of the shoe takes this to a whole new level. I think these metallic-accented monstrosities look like something that my Jazzercise Barbie would have worn with her leg warmers and belted unitard back in 1984. Sometimes I wear men’s Kayanos, simply because the toe box is wider which is good for my feet. But the guys’ Kayano 19 is no better. It’s blue and black and red and yellow and equally shiny. It looks like a toddler designed it by randomly scribbling with colored crayons on a piece of paper. After doing a little more research, I learned that these crazy metallic shoes are limited editions, and there are other more mainstream editions of Kayano 19. But they aren’t much better looking than their flamboyant siblings. The women’s are black with pink accents or pink with white accents. And I hate pink. Hate it with a passion. Gave it up around the time I put away Jazzercise Barbie, and never looked back. I know I can’t be the only woman who feels this way. Here’s the rub, ASICs designers. I need your top-of-the-line shoes because they keep me running healthy and happy. But I can’t justify spending $140 on shoes that look this ridiculous. You’ve taken a decision that’s been easy for me to make for nearly 20 years, and made it complicated and messy and upsetting. Take a nod from your counterparts at Skechers and Nike and please see what you can do for me. Anything simple and cool looking will be fine. Just no pink. Pretty please. I couldn’t agree more! Once a runner finds an incredible running shoe the feels amazing I want that shoe forever ! But at 140 and UP for a nauseating colors??? Why!!!!! And yes I still like my running shoes to look good, Because when I was a little girl, I got a pair of PF flyers! And yes I swore they made me run faster and jump higher?? That was their motto. So nice looking shoe ! I go further and feel good in a sneak that looks good and has incredible comfort. I agree I just bought a pair of New Balance sneakers and holy crap are they ugly!! They are neon green and neon pink and the girl said it was so people could see me, I told her the astronauts would be able to see me! I was just looking at methods of dying them but it seems futile as the fabric is not absorbent. Why can’t they make them in navy, brown, gray or various neutral colors? Even as a man who doesn’t usually worry about such things I have to agree. I can overlook a lot, but blaze orange, lime green, neon yellow? I want a pair of shoes not a traffic vest!! I’m having the same troubles here. I think the companies don’t know that 95% of girls actually hate pink. Why do they keep making everything pink? Should we write them? I couldn’t agree more. I’ve been putting off buying a pair for months now bc every time I shop I’m so turned off by the options that I can’t commit to a purchase. I’m an avid Asics fan but refuse to wear this clown barf (stolen from another blog). I’m ok with bright colors, but the patterns and combos they come up with (especially the metalic) are disgusting. I hope they hear us someday soon! Agreed! I’ve been a loyal Asics girl for many years (Gel Kayano or Nimbus are favorites) and I refuse to wear the horrible colors they’ve been forcing on us over the last 2 yrs. I’ve actually bought earlier model Asics – before they lost their minds – on EBay to avoid having to embarrass myself. Only a telletubbie on crack could pull this look off. Good God. I know what you mean! I went to go and buy some real running shoes about a week ago and when they showed me the selection that would fit me…I was shocked. They look like the kind of cheap shoes you would find in a discount bin at Wal-Mart. I don’t get it. They are incredibly comfortable but look like my 3-year old colored them. I desperately tried to find some neutral shoes and they simply don’t exist…so I had to shell out $160 for the ugliest but most comfortable shoes I’ve ever owned.